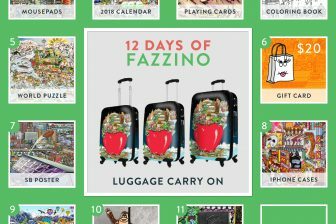 On the Third Day of Fazzino, we offer 20% off a Pop Art iPhone Case! Ring, Ring, Ring! That’s your phone calling saying it’s time to upgrade that case of yours! Choose from the vast selection of cases from the iPhone 6 to the the recently released iPhone 8 Plus. With designs ranging from a Broadway musical scene to the skylines of beautiful Manhattan, your inner New Yorker will be satisfied with the selection you made! 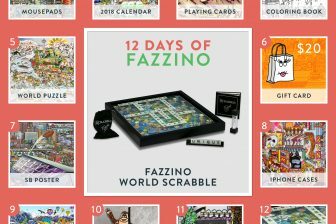 To receive 20% off, use the promo code: FAZZINODAY8 today only! 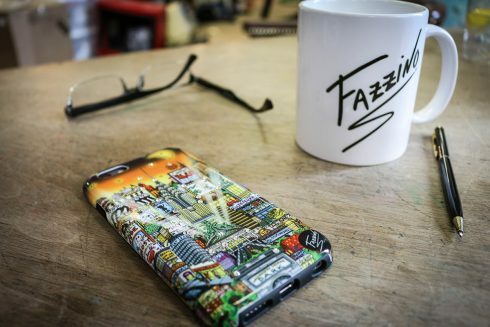 We’re giving one of these iPhone cases away for FREE. Just answer our holiday question of the day by midnight tonight in the comments below or on any of Fazzino’s social profiles (Facebook, Twitter or Instagram)! You’ll have the chance to be our randomly selected winner. The 2004 movie “Christmas with the Kranks” was the screenplay of what novel written by John Grisham? 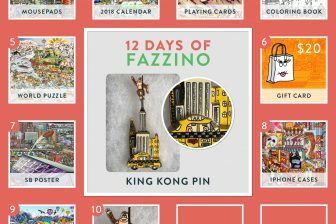 Visit the Charles Fazzino Official Gift Shop for even more holiday gift ideas and Thank You for playing along with our TWELVE DAYS OF FAZZINO.